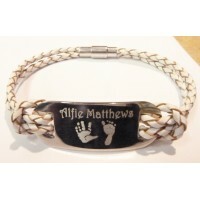 A genuine engraved Tribal, twisted brown leather and stainless steel unisex bracelet (if unsure of size please measure to be sure before ordering), complete with engraving with your text message (limited space so please keep it short). The engravable plate size is approx. 20mm x 5mm and so is perfect to add a name, perfect for engraving Dad, Daddy, Grandad or this can be a Christian name if you prefer, a really gorgeous and truly personalised gift. The bracelet is approx. 7.4” (19cm) long and is real leather and comes complete in it's own hesian Tribal gift sack bag, making an amazing gift. 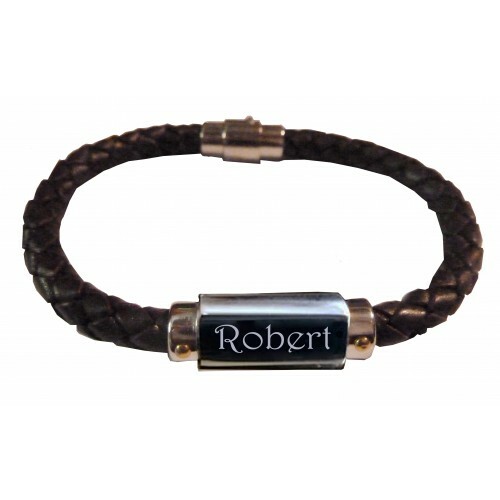 A really stunning genuine twisted brown leather, Tribal bracelet with a magnetic clasp, a lovely, personalised, keepsake gift for anyone as this can make a beautiful, detailed keepsake that tells your own story and lets you create your own personalised keepsake gift. 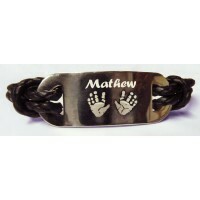 Please note that care should be taken when wearing since there is no secondary safety catch on this bracelet. 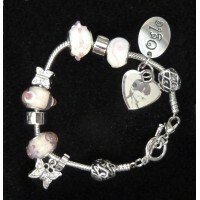 Please ensure that you check that your text is spelt correctly and no spelling mistakes are included, please also include any capital letters you want written as we will write it exactly as you instruct us to, we will not make alterations on your behalf, as you may personalise it anyway you wish, it is your jewellery. 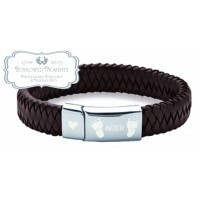 This item is normally personalised and dispatched within 2 - 3 days and will be sent via courier service for all UK Mainland deliveries to ensure the safe arrival of your gift. Details This is a BLUE Ogle Charm Bracelet with Engraved Prints Charm, featuring one or two ..
A genuine Tribal, twisted white leather hand and/or footprint bracelet for women (or for a smaller w..
A genuine Tribal, twisted black leather, hand print footprint bracelet for men (or for a larger wris.. 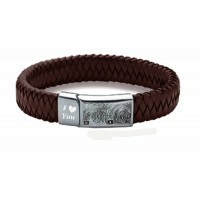 Details This is a PINK Ogle Charm Bracelet with Engraved Photo Charm, featuring your photo o..
A genuine Tribal, brown leather and silver photo charm bracelet, complete with small heart charm and..
A genuine Tribal, twisted black leather and stainless steel bracelet for men (or for a larger wrist ..
A genuine Tribal, twisted black leather and stainless steel bracelet (if unsure please measure to b..
A stunning, genuine Tribal Ladies PINK Leather Photo Charm Bracelet for women (or for a smaller wris..
A stunning, genuine Tribal Ladies BROWN Leather Photo Charm Bracelet for women (or for a smaller wri..
A stunning, genuine Tribal Ladies BROWN Leather Fingerprint Charm Bracelet for women (or for a small..
A stunning, genuine Tribal Ladies PINK Leather Fingerprint Charm Bracelet for women (or for a smalle..
A genuine Tribal, Engraved Mens Leather Hand Footprint Bracelet (23cm) complete with engraving with ..
A stunning, genuine Tribal Ladies BROWN Leather hand and/or foot print Charm Bracelet for women (or ..
A genuine leather Engraved Mens Leather Hand Footprint Bracelet (23cm) complete with engraving with ..